I love my homemade salsa recipe but sometimes it feels like it can be a production to make so I do not make it as often as I would like. Most of the time it is an afterthought to a dish I have made and it is only when I am ready to dig in that I realize how much better it would be with salsa. This happened the other day, when I made corn casserole, another favorite dish. It is delicious all by itself but it is so much better with a little salsa on top and I rarely think to make the salsa ahead of time. In this case I had all of the ingredients on hand so I decided rather than get out the processor and dirty up my kitchen again I would just chop up the fresh ingredients and make pico de gallo instead. What is the difference between pico de gallo and salsa, you ask? It's quite simple, really. Salsa is sauce that is sometimes, but not always, cooked, that was originally used as a dip, although it is often also used as a topping for casseroles, tacos, enchiladas, etc. 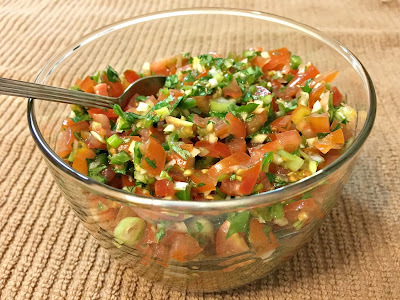 Pico de gallo (which translates as "bite of the rooster") uses fresh chopped raw ingredients, including tomatoes, but with no additional tomato liquid added as is usually the case with salsa. In all honesty the lines have been blurred between the two for a while now and one person's salsa might be another person's pico. For me, the main difference is that I use canned stewed tomatoes and the food processor for salsa, and I just cut up all of the raw fresh vegetables for pico. Is it authentic? I do not know. But they work for me for different uses. 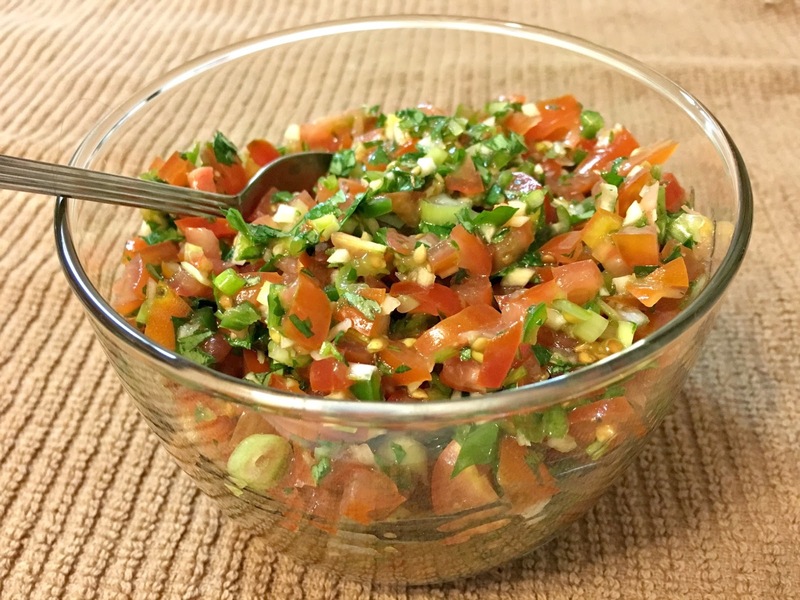 What I love about pico de gallo other than its incredible flavor is that it is easily adaptable. With some versions you do not even need tomatoes and can use mango, pineapple or corn (or some combination of any of those) instead. This is the basic recipe. If you don't have all of the ingredients available don't let that stop you. No serrano peppers? Use jalapnos. No fresh chilies? Use pickled, or even dried. No cilantro? Use oregano. No green onion? Use yellow, or red if you have them. No limes or lemons? Use vinegar. No fresh tomatoes? Use canned. No olive oil? Shame on you. Mince the chilies and garlic. Finely chop the tomatoes and thinly slice the green onions. Combine in a mixing bowl and add the lime juce, olive oil and salt. Add the cilantro and mix well. Taste and adjust salt, lime juice and olive oil as desired.